WeDigBio 2018 has begun! Does your onsite event overlap with others? Check out the growing list of onsite events. Email contact info for event organizers can be found there. Send them an email to gauge interest in a virtual meet-up during your events. This year we are leaving the online platform for use during these up to you—Sococo, AdobeConnect, Skype, Google Hangouts, Zoom, whatever works best for you. In the past two years we’ve used Sococo as a central go-to space online. It's great, but it works best when we can provide an orientation for event hosts. Hurricane Michael last week nixed that plan. But we see this as an opportunity for the event to sample some alternatives. Please let us know what you liked and didn’t with the solution that you choose. For those who used Sococo last year and liked it, it’s again available this year. A further consideration for some of you will be your desire to open a live feed of your event to the world. Maybe you have an orientation or research talk planned for your offsite participants (which would be fantastic!). Does the online platform that you like give you that option? What does an interaction look like between onsite events? It could be as simple as two rooms of people waving and smiling at one another. But maybe it’s an opportunity to hear about the importance of the collections focused upon by the other event. Maybe you share a two-minute intro to yours, followed by mention of the most interesting thing that a participant has seen so far, with the other event host reciprocating. Be creative! During the first WeDigBio event in 2015, a middle-school classroom in Tallahassee, Florida, USA, got a short virtual tour of the Smithsonian National Museum of Natural History before it opened then created digital data at its event (see above). Not an interaction between two events, but a pretty neat use of the tech! 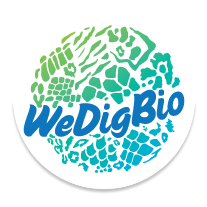 Remember to encourage your participants to tweet photos of their experience with @wedigbio in the tweet or post to Instagram using #wedigbio so that their photos make it onto the feeds at wedigbio.org.